Lately, we (TwentyBN) took a part in Activity Net trimmed action recognition challenge. The dataset is called Kinetics and recently released. It is a collection of 10 second YouTube videos. Each video has a single label among 400 different action classes. 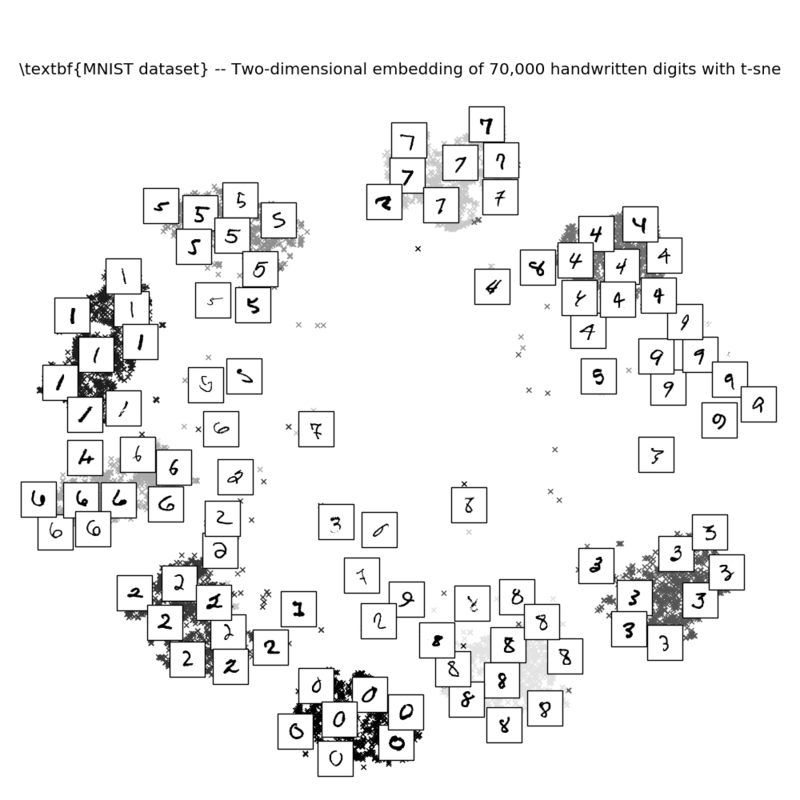 The dataset released by DeepMind with a baseline 61% Top-1 and 81.3% Top-5. For baseline models please refer to their dataset paper. But, it took 2 months for people to briskly hoist the bar high above. 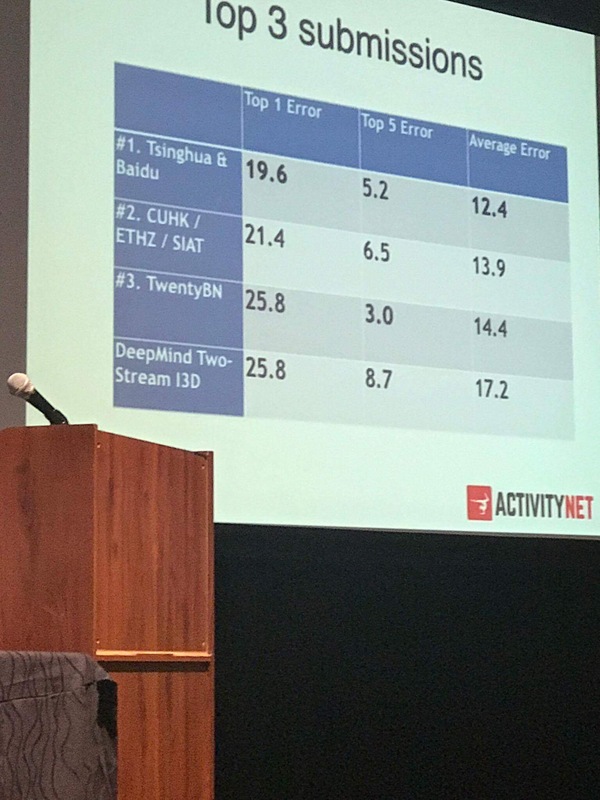 ActivityNet 2017 results from CVPR workshop presentation. As you might see above, we have the best Top-5 accuracy with 97% which is ~16% improvement on top of the baseline. The average of Top-1 and Top-5 decides the leader-board which places us to 3rd place. Yet, it is a great result for us where we could dabble only 2 weeks with limited juice. Team matters here!! Thx to my mates Raghav Goyal and Valentin Haenel for being great. Here, I like to succinctly describe our novel network architecture. It has the best single network performance. (We plan to share a more detailed description in a separate Medium soon.) Namely, it is called BesNet due to a cheap cryptographic reason :). BesNet yields 74% Top-1 with only RGB . It is half-size of the baseline network described in the DeepMind paper. In detail, BesNet is devised on top of ResNet-50 architecture. Distinctly, BesNet performs 3D convolutions that are able to learn both spatiotemporal features. In a better extent, BesNet takes not a single frame, but a set of frames from a video. It convolves pixels between consecutive frames as wells as single frame pixels. Each ResNet-50 module buckled with 1x1 + 3x3 +1x1 filters in order. Each such module followed by a residual connection coming from preceding module. It uses ReLU activation followed by a Batch-Normalization for each layer. In order to convert Resnet-50 to BesNet, we inflate 1x1 filters to 3x1x1 filters and 3x3 filters to 1x3x3 filters where the ordering of the dimensions is sequence x height x width. After convolution layers, an average pooling layer aggregates spatial dimension as in the normal ResNet. Subsequently, a max pooling layer aggregates temporal dimensions. A fully-connected layer used for predictions. 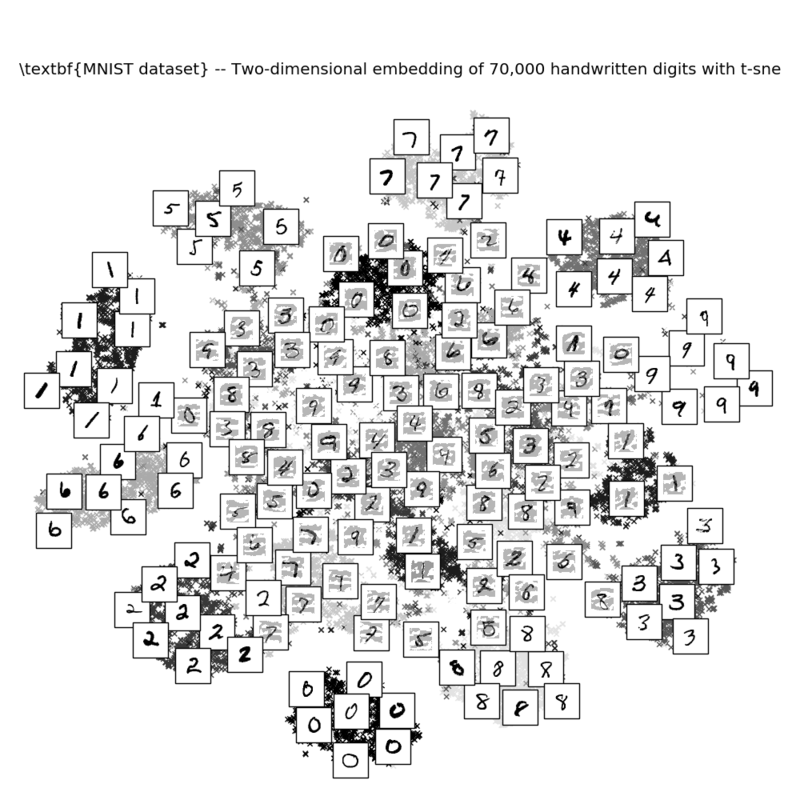 BesNet is initialized with ImageNet weights. In order to convert 2D filter weights to 3D filter weights, we replicate 2D filters along an additional dimension and then normalize the weights by the replication factor. This normalization keeps the activation values stable despite the architectural change. For example, a 1x1 filter is converted to 3x1x1 by copying the 1x1 filter 3 times along the third dimension and weights are divided by 3 at the end. BesNet module excluding residual connection. d [1,2] describes random selection of dilation factor between 1 or 2. Dimensions are sequence x height x width. BesNet has a peculiar use of dilation in 3x1x1 layers which defines the real novel aspect of our architecture. BesNet uses dilation only on temporal dimension and it picks a random dilation factor per 3x1x1 layer for each mini-batch. It sets padding parameters in accordance to keep the temporal dimension unchanged. At the test time, each layer computes outputs for each possible dilation factor, then takes the average of the output feature maps. Random dilation enables the network to learn complex temporal relations. It also regularizes the network in the temporal domain. In practice, it reduces the effect of FPS used for casting videos into frames. Dilation in 1D with increasing dilation factor per layer. The aim here to increase receptive field exponentially with less network paramerters. In our case we set dilation factor random thus our network is able to learn more relations that are also corresponding to gray shade nodes and connections. We discuss that for Kinetics, it is important to learn long range relations between frames. Videos are long and they have only a single label. So the network needs to learn the general context of the video. In that sense, small motions that are observed by a normal 3D convolution are not that important. Random dilation pays into this. It augments the contextual temporal window of the network. Our experiments with only frame futures support our hypothesis here. We extracted frame features with ResNet-50 and train an MLP after pooling the features. It gets 65% accuracy. It is better than DeepMind's baseline network with 3D convolution layers. That shows us contextual information means more than motion learned by 3D layers. Motion information might be complementary but not the core. It is then verified by the random dilation. BesNet with no dilation results 70% , dilation 2 68% and the random dilation 74% accuracy. This stands to be a simple empirical proof backing our claim here. Random dilation is really easy to implement with Pytorch. Just take normal Conv class and overwrite its forward pass by randomizing dilation parameter. If you like to try out before we release fell free. I try to give a very sketchy description of BesNet here by no means complete. Please ping me if you have any question. We plan to study BesNet a little more and share it in the near future in legit formats. We also plan to share a finer description of our challenge approach with some open-source enjoyment. Please note that BesNet is a work in progress. Anyways, feedbacks are always warmly welcome. Best :). Sometimes, It is really a mess to try installing OpenCV to your system. Nevertheless, it is really great library for any case of vision and you are obliged to use it. (No complain, just C++). I try to list my commands here in a sequence and hope it will work for you too. This cmake command targets python3.x and your target virtual environment. Therefore, before running it activate your environment. Do not forget to check flags depending on your case. cmake -DWITH_CUDA=OFF -DBUILD_TIFF=ON -DBUILD_opencv_java=OFF -DENABLE_AVX=ON -DWITH_OPENGL=ON -DWITH_OPENCL=ON -DWITH_IPP=ON -DWITH_TBB=ON -DWITH_EIGEN=ON -DWITH_V4L=ON -DWITH_VTK=OFF -DBUILD_TESTS=OFF -DBUILD_PERF_TESTS=OFF -DCMAKE_BUILD_TYPE=RELEASE -DBUILD_opencv_python2=OFF -DCMAKE_INSTALL_PREFIX=$(python3 -c "import sys; print(sys.prefix)") -DPYTHON3_EXECUTABLE=$(which python3) -DPYTHON3_INCLUDE_DIR=$(python3 -c "from distutils.sysconfig import get_python_inc; print(get_python_inc())") -DPYTHON3_PACKAGES_PATH=$(python3 -c "from distutils.sysconfig import get_python_lib; print(get_python_lib())") -D CMAKE_BUILD_TYPE=RELEASE -D CMAKE_INSTALL_PREFIX=/usr/local -D INSTALL_PYTHON_EXAMPLES=ON -D INSTALL_C_EXAMPLES=OFF -D PYTHON_EXECUTABLE=~/miniconda3/envs/dl/bin/python -D BUILD_EXAMPLES=ON .. I owned a Raspberry Pi long ago and it was just sitting in my tech wash box. After watching a Youtube session of creative Raspberry applications, with envy , I decided to try something by myself. The first obvious idea to me was a home security system to inspect your house while you are away. 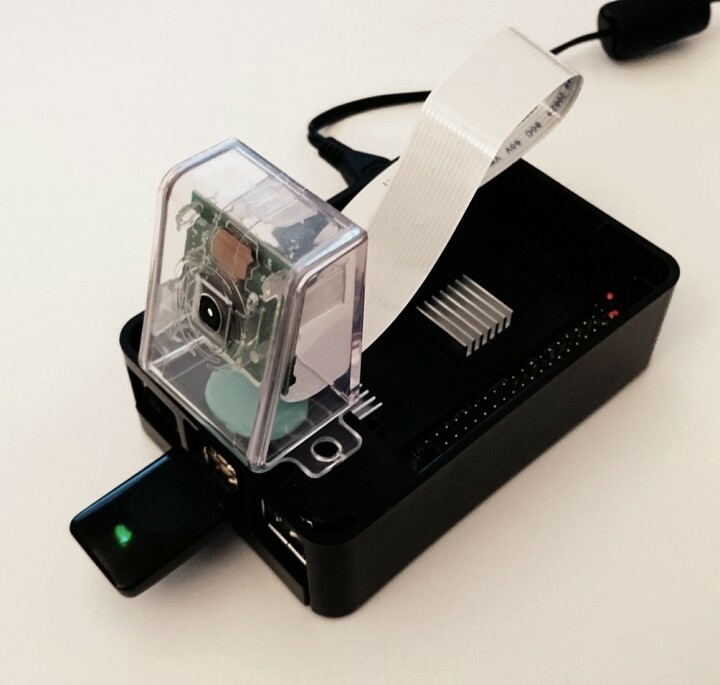 The final thingy is able to detect and roughly localize any motion through a camera. It takes photos and mails them to your email account. Plus, we are able to interact with it in our local network using a simple web interface so we are able to activate or deactivate it in front of home door. I assume that if someone is able to reach the local wifi network, most probably s/he is one of us (fair enough ?). The whole heading of the paper is "The Shattered Gradients Problem: If resnets are the answer, then what is the question?". It is really interesting work with all its findings about gradient dynamics of neural networks. It also examines Batch Normalization (BN) and Residual Networks (Resnet) under this problem. The problem, dubbed "Shattered Gradients", described as gradient feedbacks resembling random noise for nearby data points. White noise gradients (random value around 0 with some unknown variance) are not useful for training and they stall the network. What we expect to see is Brownian noise (next value is obtained with a small change on the last value) from a working model. Deep neural networks are more prone to white noise gradients. However, latest advances like BN and Resnet are described to be more resilient to random gradients even in deep networks. White noise gradients undermines the effectiveness of networks because they violates gradient based learning methods which expects similar gradient feedbacks for data points close by in the vector space. Once you have white noise gradient for such close points, the model is not able to capture data manifold through these learning algorithms. Brownian updates yields more correlation on updates and this preludes effective learning. For normal networks, they give a empirical evidence that the correlation of network updates decreases with the order where L is number of layers. Decreasing correlation means more white noise gradient feedbacks. One important reason of white noise feedbacks is to be co-activations of network units. From a working model, we expect to have units receptive to different structures in the given data. Therefore, for each different instance, different subset of units should be active for effective information flux. They observe that as activation goes through layers, co-activation rate goes higher. BN layers prevents this by keeping the co-activation rate 1/4 (1/4 units are active per layer). Beside the co-activation rate, how dispersed units activation is another important question. Thus, similar instances need to activate similar subset of units and activation should be distributes to other subsets as we change the data structure. This stage is where the skip-connections get into the play. Their observation is skip-connections improve networks in that respect. This can be observed at below figure. The effectiveness of skip-connections increases with Beta scaling introduced by InceptionV4 architecture. It is scaling residual connections by a constant value before summing up with the current layer activation. This is a very intriguing paper to me as being one of the scarse works investigating network dynamics instead of blind updates on architectures for racing accuracy values. Resnet is known to be train hundreds of layers which was not possible before. Now, with this work, we have another scientific argument explaining its effectiveness. I also like to point Veit et al. (2016) demystifying Resnet as an ensemble of many shallow networks. When we combine both of these papers, it makes total sense to me how Resnets are useful for training very deep networks. If shattered gradient effect, as stated here, increasing with number of layers with the order 2^L then it is impossible to train hundred layers with an ad-hoc network. Corollary, since Resnet behaves like a ensemble of shallow networks this effects is rehabilitated. We are able to see it empirically in this paper and it is complimentary in that sense. 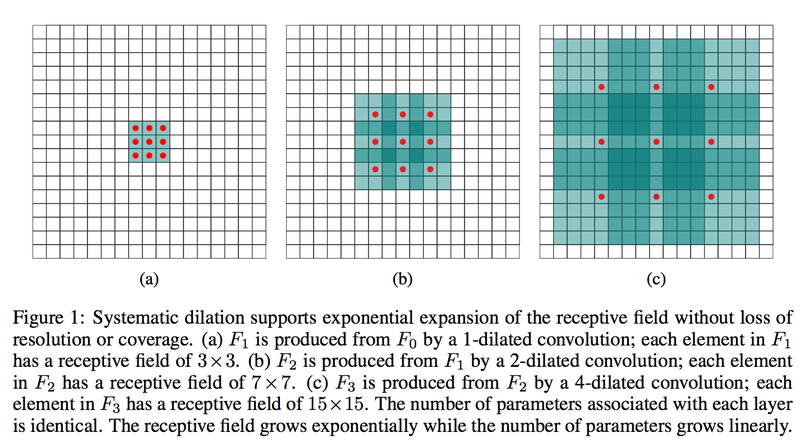 In simple terms, dilated convolution is just a convolution applied to input with defined gaps. With this definitions, given our input is an 2D image, dilation rate k=1 is normal convolution and k=2 means skipping one pixel per input and k=4 means skipping 3 pixels. The best to see the figures below with the same k values. The figure below shows dilated convolution on 2D data. Red dots are the inputs to a filter which is 3x3 in this example, and green area is the receptive field captured by each of these inputs. Receptive field is the implicit area captured on the initial input by each input (unit) to the next layer . Dilated convolution is a way of increasing receptive view (global view) of the network exponentially and linear parameter accretion. With this purpose, it finds usage in applications cares more about integrating knowledge of the wider context with less cost. One general use is image segmentation where each pixel is labelled by its corresponding class. In this case, the network output needs to be in the same size of the input image. Straight forward way to do is to apply convolution then add deconvolution layers to upsample. However, it introduces many more parameters to learn. Instead, dilated convolution is applied to keep the output resolutions high and it avoids the need of upsampling . Dilated convolution is applied in domains beside vision as well. One good example is WaveNet text-to-speech solution and ByteNet learn time text translation. They both use dilated convolution in order to capture global view of the input with less parameters. Detection of fine-details by processing inputs in higher resolutions. Broader view of the input to capture more contextual information. Machine learning is everywhere and we are amazed with capabilities of these algorithms. However, they are not great and sometimes they behave so dumb. For instance, let's consider an image recognition model. This model induces really high empirical performance and it works great for normal images. Nevertheless, it might fail when you change some of the pixels of an image even so this little perturbation might be indifferent to human eye. There we call this image an adversarial instance. There are various methods to generate adversarial instances . One method is to take derivative of the model outputs wrt the input values so that we can change instance values to manipulate the model decision. Another approach exploits genetic algorithms to generate manipulative instances which are confidently classified as a known concept (say 'dog') but they are nothing to human eyes. Generating adversaries by input gradient . So why these models are that weak against adversarial instances. One reliable idea states that because adversarial instances lie on the low probability regions of the instance space. Therefore, they are so weird to the network which is trained with a limited number of instances from higher probability regions. That being said, maybe there is no way to escape from the fretting adversarial instances, especially when they are produced by exploiting weaknesses of a target model with a gradient guided probing. This is a analytic way of searching for a misleading input for that model with an (almost) guaranteed certainty. Therefore in one way or another, we find an perturbed input deceiving any model. Due to that observation, I believe that adversarial instances can be resolved by multiple models backing each other. In essence, this is the motivation of this work. In this work, I like to share my observations focusing on strength of the ensembles against adversarial instances. This is just a toy example with so much short-comings but I hope it'll give the idea with some emiprical evidences. 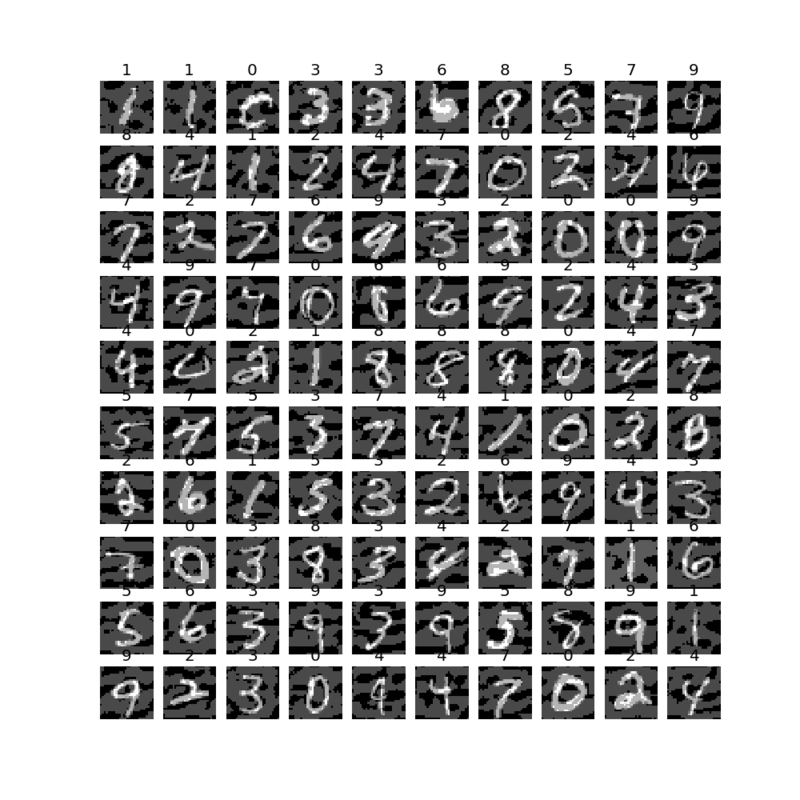 Train a baseline MNIST ConvNet. Create adversarial instances on this model by using cleverhans and save. Measure the baseline model performance on adversarial. Train the same ConvNet architecture including adversarial instances and measure its performance. Train an ensemble of 10 models of the same ConvNet architecture and measure ensemble performance and support the backing argument stated above. My code full code can be seen on github and I here only share the results and observations. You need cleverhans, Tensorflow and Keras for adversarial generation and you need PyTorch for ensemble training. (Sorry for verbosity of libraries but I like to try PyTorch as well after yeras of tears with Lua). One problem of the proposed experiment is that we do not recreate adversarial instances for each model and we use a previously created one. Anyways, I believe the empirical values verifies my assumption even in this setting. In addition, I plan to do more extensive study as a future work. I start by training a simple ConvNet architecture on MNIST dataset by using legitimate train and test set splits. This network gives 0.98 test set accuracy after 5 epochs. 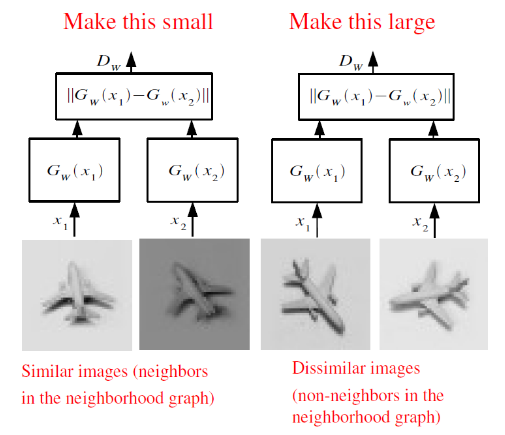 For creating adversarial instances, I use fast gradient sign method which perturbs images using the derivative of the model outputs wrt the input values. You can see a bunch of adversarial samples below. The same network suffers on adversarial instances (as above) created on the legitimate test set. It gives 0.09 accuracy which is worse then random guess. Then I like to see the representational power of the trained model on both the normal and the adversarial instances. I do this by using well-known dimension reduction technique T-SNE. 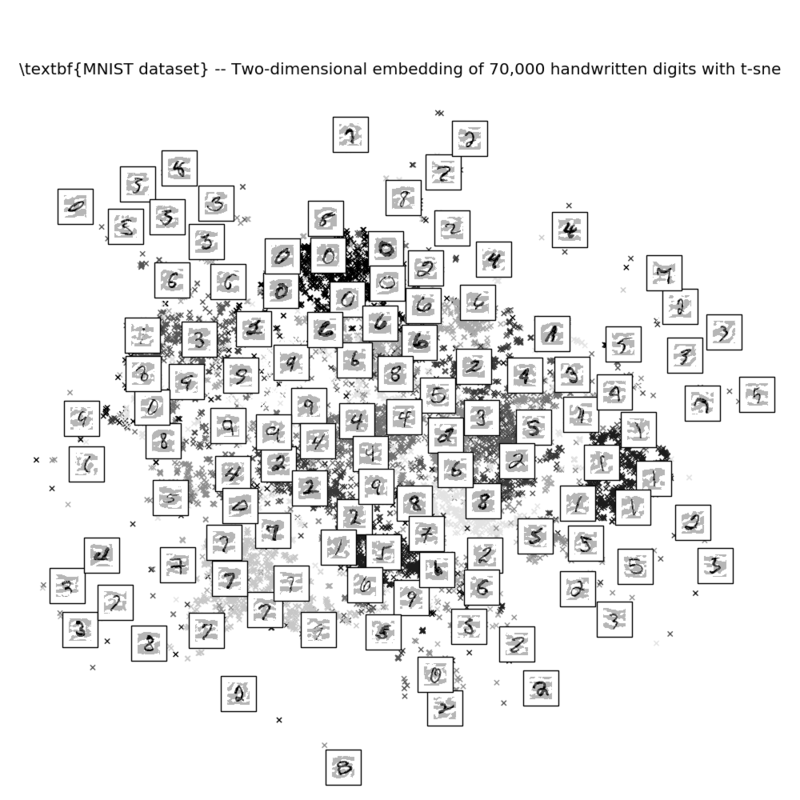 I first compute the last hidden layer representation of the network per instance and use these values as an input to T-SNE which aims to project data onto 2-D space. Here is the final projection for the both types of data. Projection of normal test set. Projection of both adversarial and normal test instances. These projections clearly show that adversarial instances are just a random data points to the trained model and they are receding from the real data points creating what we call low probability regions for the trained model. I also trained the same model architecture by dynamically creating adversarial instances in train time then test its value on the adversarials created previously. This new model yields 0.98 on normal test set, 0.91 on previously created adversarial test set and 0.71 on its own dynamically created adversarial. Above results show that including adversarial instances strengthen the model. However, this is conforming to the low probability region argument. By providing adversarial, we let the model to discover low probability regions of adversarial instances. Beside, this is not applicable to large scale problems like ImageNet since you cannot afford to augment your millions of images per iteration. Therefore, by assuming it works, ensembling is more viable alternative as already a common method to increase overall prediction performance. In this part, I train multiple models in different ensemble settings. First, I train N different models with the same whole train data. Then, I bootstrap as I train N different models by randomly sampling data from the normal train set. I also observe the affect of N.
The best single model obtains 0.98 accuracy on the legitimate test set. However, the best single model only obtains 0.22 accuracy on the adversarial instances created in previous part. When we ensemble models by averaging scores, we do not see any gain and we stuck on 0.24 accuracy for the both training settings. However, surprisingly when we perform max ensemble (only count on the most confident model for each instance), we observe 0.35 for uniformly trained ensemble and 0.57 for the bootstrapped ensemble with N equals to 50. Increasing N raises the adversarial performance. It is much more effective on bootstrapped ensemble. With N=5 we obtain 0.27 for uniform ensemble and 0.32 for bootstrapped ensemble. With N=25 we obtain 0.30 and 0.45 respectively. These values are interesting especially for the difference of mean and max ensemble. My intuition behind the superiority of maxing is maxing out predictions is able to cover up weaknesses of models by the most confident one, as I suggested in the first place. In that vein, one following observation is that adversarial performance increases as we use smaller random chunks for each model up to a certain threshold with increasing N (number of models in ensemble). It shows us that bootstrapping enables models to learn some of the local regions better and some worse but the worse sides are covered by the more confident model in the ensemble. As I said before, it is not convenient to use previously created adversarials created by the baseline model in the first part. However, I believe my claim still holds. Assume that we include the baseline model in our best max ensemble above. Still its mistakes would be corrected by the other models. I also tried this (after the comments below) and include the baseline model in our ensemble. 0.57 accuracy only reduces to 0.55. It is still pretty high compared to any other method not seeing adversarial in the training phase. It is much more harder to create adversarials for ensemble of models with gradient methods. However, genetic algorithms are applicable. Blind stops of individual models are covered by the peers in the ensemble when we rely on the most confident one. We observe that as we train a model with dynamically created adversarial instances per iteration, it resolves the adversarials created by the test set. That is, since as the model sees examples from these regions it becomes immune to adversarials. It supports the argument stating low probability regions carry adversarial instances. (Before finish) This is Serious! Before I finish, I like to widen the meaning of this post's heading. Ensemble against adversarial!! "Adversarial instances" is peculiar AI topic. It attracted so much interest first but now it seems forgotten beside research targeting GANs since it does not yield direct profit, compared to having better accuracy. Even though this is the case hitherto, we need consider this topic more painstakingly from now on. As we witness more extensive and greater AI in many different domains (such as health, law, governace), adversarial instances akin to cause greater problems intentionally or by pure randomness. This is not a sci-fi scenario I'm drawing here. It is a reality as it is prototyped in . Just switch a simple recognition model in  with a AI ruling court for justice. Therefore, if we believe in a future embracing AI as a great tool to "make the world better place! ", we need to study this subject extensively before passing a certain AI threshold. This work overlooks many important aspects but after all it only aims to share some of my findings in a spare time research. For a next post, I like study unsupervised models like Variational Encoders and Denoising Autoencoders by applying these on adversarial instances (I already started!). In addition, I plan to work on other methods for creating different types of adversarials. Good example codes waiting you on github that can be used many different projects. Some of non-proven claims and opinions on the topic. Nguyen, A., Yosinski, J., & Clune, J. (2015). Deep Neural Networks are Easily Fooled. Computer Vision and Pattern Recognition, 2015 IEEE Conference on, 427–436. This paper studies description of semantic information with higher level units of an network and blind spot of the network models againt adversarial instances. They illustrate the learned semantics inferring maximally activating instances per unit. They also interpret the effect of adversarial examples and their generalization on different network architectures and datasets. Adversarial instances are general to different models and datasets. Adversarial instances are more significant to higher layers of the networks. 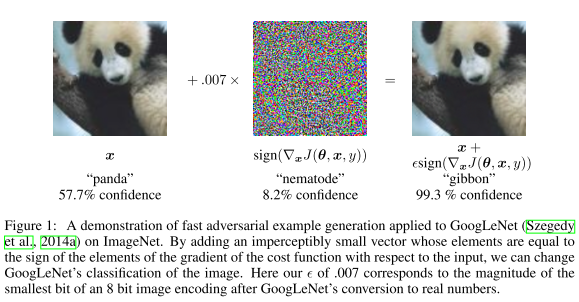 Auto-Encoders are more resilient to adversarial instances. They posit that advertorials exploiting a particular network architectures are also hard to classify for the others. They illustrate it by creating adversarial instances yielding 100% error-rate on the target network architecture and using these on the another network. It is shown that these adversarial instances are still hard for the other network ( a network with 2% error-rate degraded to 5%). Of course the influence is not that strong compared to the target architecture (which has 100% error-rate). Adversarial instances are more significant to higher layers of networks. As you go to higher layers of the network, instability induced by adversarial instances increases as they measure by Lipschitz constant. This is justifiable observation with that the higher layers capture more abstract semantics and therefore any perturbation on an input might override the constituted semantic. (For instance a concept of "dog head" might be perturbed to something random). AE is an unsupervised algorithm and it is different from the other models used in the paper since it learns the implicit distribution of the training data instead of mere discriminant features. Thus, it is expected to be more tolerant to adversarial instances. It is understood by Table2 that AE model needs stronger perturbations to achieve 100% classification error with generated adversarials. One intriguing observation is that shallow model with no hidden unit is yet to be more robust to adversarial instance created from the deeper models. It questions the claim of generalization of adversarial instances. I believe, if the term generality is supposed to be hold, then a higher degree of susceptibility ought to be obtained in this example (and in other too). I also happy to see that unsupervised method is more robust to adversarial as expected since I believe the notion of general AI is only possible with the unsupervised learning which learns the space of data instead of memorizing things. This is also what I plan to examine after this paper to see how the new tools like Variational Auto Encoders behave againt adversarial instance. I believe that it is really hard to fight with adversarial instances especially, the ones created by counter optimization against a particular supervised model. A supervised model always has flaws to be exploited in this manner since it memorizes things [ref] and when you go beyond its scope (especially with adversarial instances are of low probability), it makes natural mistakes. 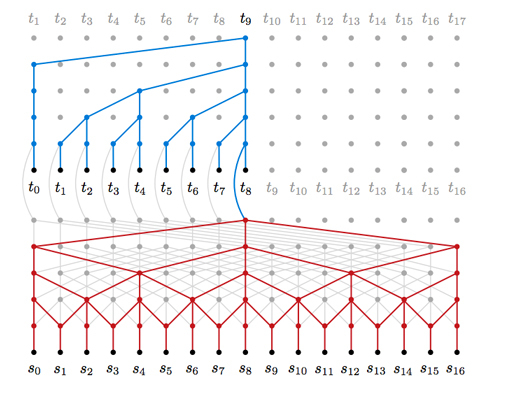 Beside, it is known that a neural network converges to local minimum due to its non-convex nature. Therefore, by definition, it has such weaknesses. Adversarial instances are, in practical sense, not a big deal right now.However, this is akin to be a far more important topic, as we journey through a more advanced AI. Right now, a ML model only makes tolerable mistakes. However, consider advanced systems waiting us in a close future with a use of great importance such as deciding who is guilty, who has cancer. Then this is question of far more important means.